ON THIS DATE (August 30, 1960) ... 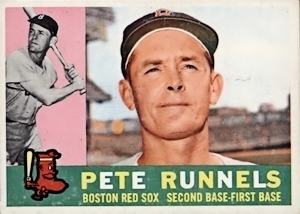 In the first game of a doubleheader, Pete Runnels, with his sixth hit in seven at bats, doubled to center with one out in the last of the 15th inning to score Frank Malzone from first base and give the Red Sox a 5-4 victory. With six hits in the first game and 3 for 4 in the second game, including two doubles, Runnels had nine hits in eleven trips. The two games lasted 4 hours and 6 minutes and 2 hous and 50 minutes, coming to an end at 1:20 in the morning. With Boston's Earl Wilson and Detroit's Jim Bunning in a scoreless pitcher's duel, Runnels (with his 8th hit in 10 trips) opened the seventh inning of game two with a double to left. Wilson, himself broke the scoreless tie with a double scoring Runnels with the game's first run. In the first game, Runnels' double to center in the 15th inning gave southpaw Ted Wills his first victory. His six hits were the most in an American League game since July 8, 1955. With 9 for 11 in the doubleheader, Runnels tied the major league record.